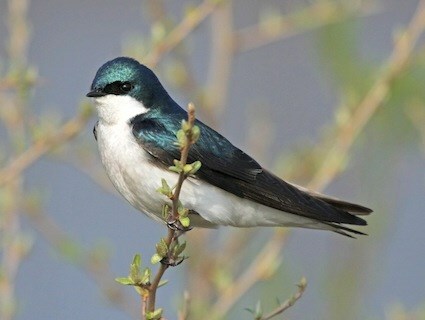 The familiar, and not so familiar look at Ohio’s birds. Voice: Song a steady hissing buzz. Habitat: Freshwater marshes and wet meadows in interior and brackish marshes along coast; in winter in salt and brackish marshes. Nesting: Open cup of grass stems and blades, lined with finer grass blades and sometimes built up on sides to form partial covering. 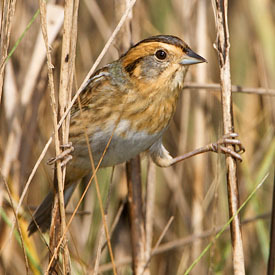 FYI’s: The Nelson’s Sharp-tailed Sparrow formerly was considered the same species as the Saltmarsh Sharp-tailed Sparrow, collectively known as the Sharp-tailed Sparrow. The two forms have separate breeding ranges that barely overlap in Maine. They differ in genetics, songs, and subtle plumage characters. Description: Length 8 1/2″ ADULT SUMMER Beautifully marked with chestnut on crown and ear coverts, broad pale supercilium, and otherwise dark-streaked face and neck. Underparts have distinct dark bars; feathers on back have dark centers. ADULT WINTER Has mainly gray upperparts and white underparts; note the pale supercilium. JUVENILE Similar to winter adult, but feathers on back have cleaner-looking pale margins. 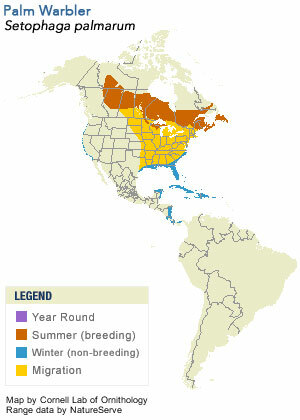 Habitat: Very common locally high Arctic breeding species, from northern Alaska to Hudson Bay. Common on Atlantic coast during fall migration. 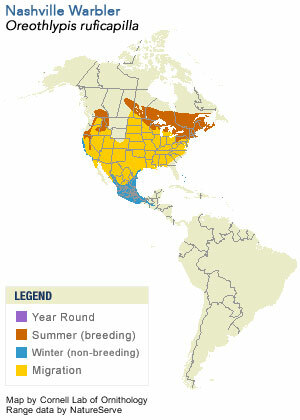 Winters mainly in Central and South America, but small numbers remain on Gulf coast. 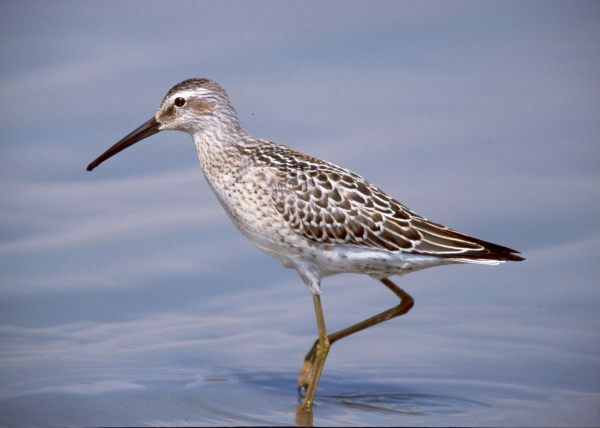 FYI’s: The main southward migration route of the Stilt Sandpiper passes through the middle of the continent, west of the Mississippi River. From here, in fall the species migrates over water to the Caribbean or northern South America, where many birds interrupt their migration to molt flight feathers before continuing to winter haunts in inland central South America. Description: 4 -5″ (10 – 13 cm) ADULT MALE Has mainly olive-green back, with darker flight feathers and tail. Head and neck are mostly blue-gray, but note rufous crown patch and white eyering; throat and underparts are bright yellow. Legs are dark. ADULT FEMALE Similar to male, but less colorful, with dull underparts, browner head, and reduced crown patch. IMMATURE Similar to adult female, but even paler, with whitish throat and belly and no crown patch. Voice: Song is in two parts, first bouncy and whistling, second rapid and trilling: t’se-t’se-t’se-t’se, se’se’se’se’se; call is a thin tsip. Habitat: Common summer visitor (mainly May-Aug) to deciduous and mixed, brushy woods; often in secondary growth. Winters in Central America. Nesting: A neat cup of moss, bark, leaves, and grasses, lined with fine grass, pine needles, hair, or other fiber. Located on the ground under brushy vegetation or small trees. The western population of the Nashville Warbler was once considered a separate species, called the “Calaveras Warbler.” It is slightly brighter than eastern birds, with a brighter yellow rump, more extensive white feathers on the lower belly, and a slightly longer tail. Description: 5 1/2″ (14 cm) SPRING ADULT Eastern breeder has mostly olive-buff upperparts with faint streaking on back and two very faint, pale wing bars. Head has extensive chestnut crown, yellow supercilium, olive cheeks, and yellow throat with dark malar stripe; underparts are otherwise bright yellow, with rufous streaks on flanks. Western breeder has grayer back and wings; yellow is restricted to throat and undertail coverts. FALL ADULT AND IMMATURE Less colorful than their respective spring adult counterparts, lack rufous crown and streaks on flanks, are only lightly streaked above and have faint buff wing bars. Eastern breeder has yellowish supercilium and yellow wash to underparts; western breeder has white supercilium and gray underparts except for yellow undertail coverts. Habitat: Breeds in bogs, open boreal coniferous forest, and partly open situations with scattered trees and heavy undergrowth, usually near water. Found in migration and winter in a variety of woodland, second growth and thicket habitats, on the ground in savanna and open fields, and in mangroves. Nesting: 4-5 eggs that are creamy white with dark speckles around large end. Open cup of weed stalks, grass, sedges, bark shreds, rootlets, and ferns, lined with fine grasses, bryophytes, and occasionally hair and feathers. Placed in sphagnum moss at base of short tree. The Palm Warbler is found in two different forms. Birds that breed in the western part of the range are duller, and have whitish bellies. Those breeding in the eastern part of the range are entirely yellow underneath.